An aerial photograph of Lincoln University in Lincoln. 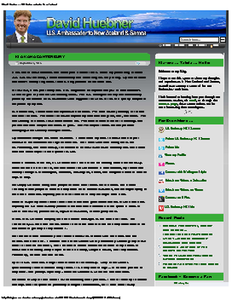 A blog post from US Ambassador to New Zealand and Samoa, David Huebner, titled, "Kia Kaha Canterbury". 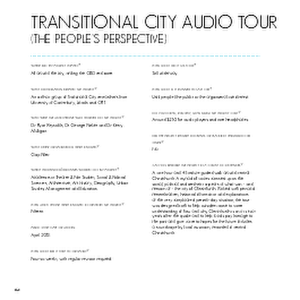 A PDF copy of pages 290-291 of the book Christchurch: The Transitional City Pt IV. 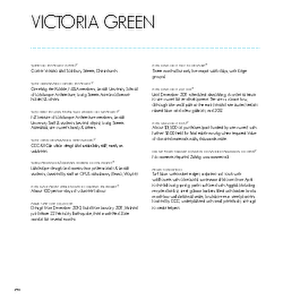 The pages document the transitional project 'Victoria Green'. A PDF copy of pages 292-293 of the book Christchurch: The Transitional City Pt IV. 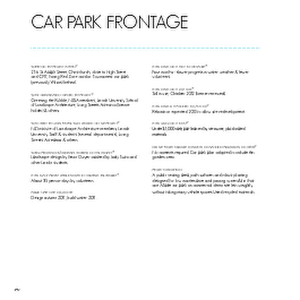 The pages document the transitional project 'Car Park Frontage'. 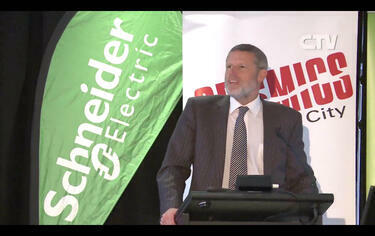 A video of an address by Mike Underhill, Chief Executive of Energy Efficiency Conservation Authority (EECA), at the 2014 Seismics and the City forum. This talk was part of the Building Innovation section. A video of an address by Dr. Rod Carr, Vice Chancellor of the University of Canterbury, at the 2014 Seismics and the City forum. This talk was part of the Building Innovation section. 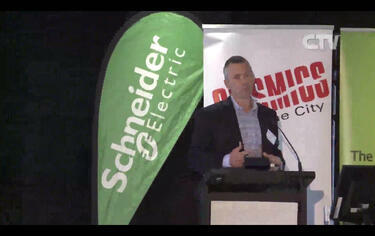 A video of an address by David Freeman-Greene, General Manager for Commercial at Orion, at the 2014 Seismics and the City forum. This talk was part of the Building Innovation section. 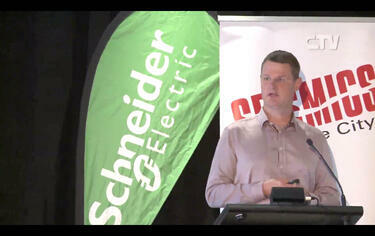 A video of an address by Andre Lovatt, CEO of the Arts Centre, at the 2014 Seismics and the City forum. This talk was part of the Building Innovation section. 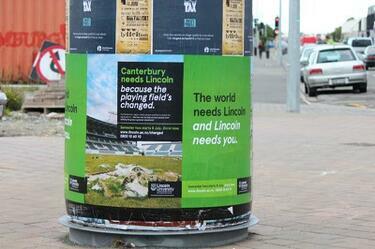 A photograph of posters on a bollard. The photograph is captioned by Paul Corliss, "Tuam Street and High Street shops, CBD. By Alice's". A PDF copy of signage for the Places of Tranquillity initiative. 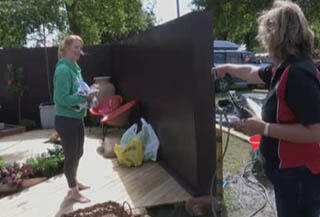 Healthy Christchurch lead the collaborative project to create six gardens of beauty and peace to fill in some of the grey demolition sites across Christchurch. The signage promotes the initiative and invites people to register to create tranquil gardens at healthychristchurch.org.nz. 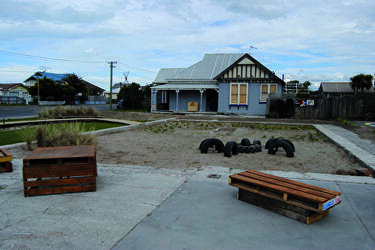 "Healthy Christchurch is leading this innovative collaboration creating six gardens of beauty and peace to fill in some of the grey demolition sites across Christchurch.These gardens are for peace and tranquillity as well as family and community use with spaces designed for both." 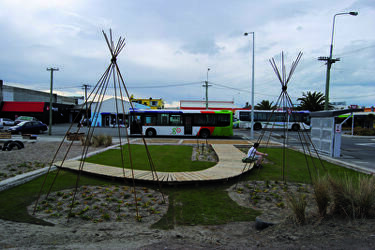 "This is a Healthy Christchurch collaboration in partnership with the city's ethnic communities to include their traditions, cultures and spiritual beliefs. This ensures that these communities' voices and presence is more visible in the rebuild of our city. There are three key partners in this collaborative project. Greening the Rubble are providing expertise in temporary site development and project managing the creation. Lincoln University School of Landscape Architecture provided the student competition and are supporting the winning students and their designs into fruition. 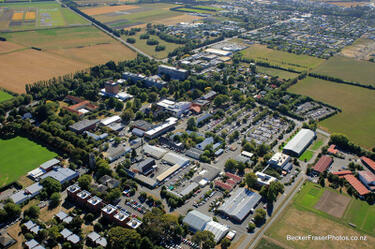 Community and Public Health (CDHB) provide the overall project management, networks and promotion." "In 2012 Lincoln University School of Landscape Architecture students created 40 beautiful designs for the Places of Tranquillity. Six winning designs were chosen from the 995 votes made online or at the displays at Community and Public Health and the Migrant Centre. The six winners were announced at the Healthy Christchurch Hui on the 31st May 2012. Each winning student received a Certificate and a $50 Scorpio Book Voucher. 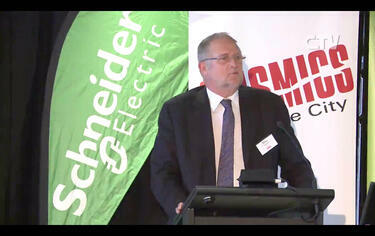 The awards were presented by Michelle Mitchell, General Manager of the CERA Wellbeing Team." 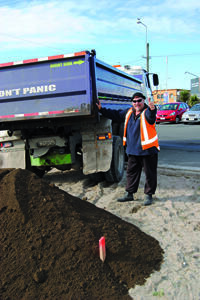 A photograph of a truck delivering soil for a beach garden in New Brighton. 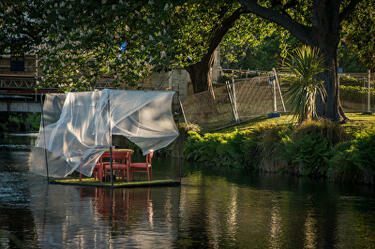 A close-up photograph of a floating installation titled The River on the Avon River. The installation consists of four chairs and a table situated on a grass-covered platform, with net curtains hanging from the frame. 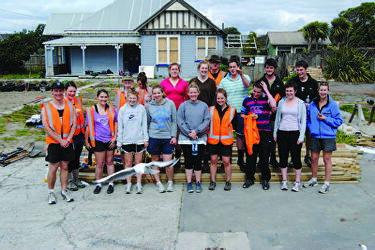 It was created by students from Lincoln University's School of Landscape Architecture for Canterbury Tales, a carnivalesque procession and the main event of FESTA 2013. 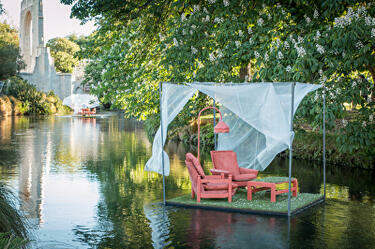 A photograph of a floating installation titled The River on the Avon River. The installation consists of two armchairs, a table and a floor lamp situated on a grass-covered platform, with net curtains hanging from the frame. 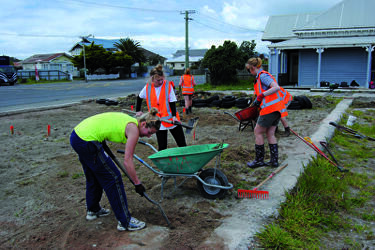 It was created by students from Lincoln University's School of Landscape Architecture for Canterbury Tales, a carnivalesque procession and the main event of FESTA 2013.